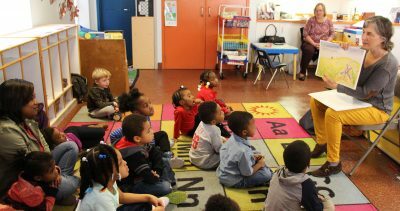 The children at the Child Care Center gathered on the carpet to listen to a story that hadn’t been published yet. President of Morning Circle Media Cynthia Kreilick read her upcoming book “A Lens for a Lighthouse” for a story critique. Former co-worker of Cynthia’s and current grant writer for the Ministry of Caring, Carol Carr, invited Cynthia. 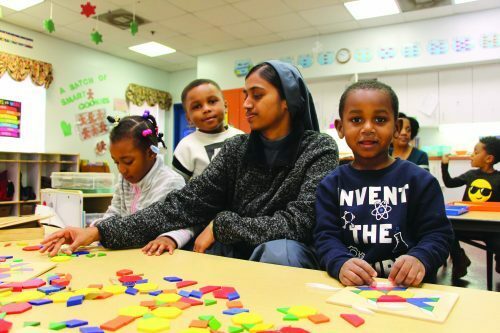 Based out of Philadelphia, Morning Circle Media’s goal is to provide children with early literacy and introduce them to corss-cultural experiences. Many of their books are in different languages. Cynthia noted that it is critical to ask for direct feedback from the demographic that will be reading the story. She was also surprised the kids knew what a fun house and a Ferris wheel was. The only item they didn’t know was the outhouse and when it was explained, several giggles ripped across the room. The story critique not only benefits Cynthia, but the children too. “We’ve gotten a lot of compliments on the style of the illustration — that it’s not computer generated — somebody’s using their hand and their imagination to create these beautiful illustrations,” says Cynthia. At the end of the story, Cynthia revealed that she brought a second surprise for the Child Care Center: bubble boxes. The kids folded up boxes that contained soap, crayons and a coloring page. Thank you to Cynthia for bringing a creative opportunity for the kids! Program Director and Early Childhood Administrator Paulette Annane believes that any individual can be “flipped.” Staff and volunteers at all three child care centers gathered at the Francis X. Norton Center for the Flip It! training led by Paulette along with Early Childhood Administrator Janet Chandler and Curriculum Coordinator Patti Lynch. Paulette once took a two-day training on the Flip It! strategy through the Devereux Center for Resilient Children and thought it would be beneficial to figure out how to diffuse difficult situations. “We all came together to learn about the strategy using real life scenarios such as ‘What do you do if a child is biting? What do you do if a child is running out of a classroom?’” says Paulette. Flip stands for Feelings, Limits, Inquiry, and Prompts. The strategy leads a child to recognize their emotions and problem-solve effectively. Paulette appreciated the hands on training. “It related to what they’re seeing in their classrooms when it comes to challenging behaviors, such as hitting, biting or having a little separation anxiety from mom,” says Paulette. Paulette hopes to include information on the training in their own newsletter so that parents can also implement these strategies with their children at home. WDEL hosted its 13th annual Feed-a-Friend pledge and donation event on March 19. 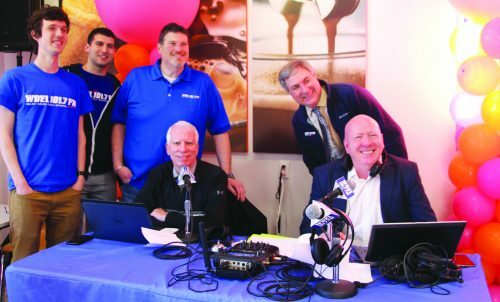 The station held its daily broadcast for 12 hours at the Tally Ho Plaza Shopping Center Dunkin’. The goal: to fundraise for vital community organizations such as the ministry. WDEL reporter and anchor Mark Fowser noted that the event’s timing recently switched from Thanksgiving. Before the event, Mark visited the Child Care Center and Emmanuel Dining Room West to interview Program Directors Paulette Annane and ReeNee LaFate and clients of their programs. “I enjoy meeting the people who are actually benefitting from this and hearing the difference it makes in their lives and learning that people who might have come here once upon a time — as someone who was served — they are now serving others,” says Mark. Director of News and Programming Chris Carl was one of WDEL staff that helped run the event at Dunkin’. He explained that this is the first year that WDEL took the event outside its studio. Chris highlighted that community engagement is important to WDEL. He also mentioned that WDEL reporters interviewed each beneficiary of Feed-a-Friend, which included the ministry, Sunday Breakfast Mission, Horizon House, Newark Area Welfare Committee and YWCA Delaware. At the end of the twelve hour broadcast, WDEL raised over $6,000. We thank WDEL for their partnership and generosity! The Rapid Rehousing team invited landlords and property owners around New Castle County to an open house to learn about the Ministry of Caring and the Rapid Rehousing program. According to Rapid Rehousing Director Michael Sullivan, the ultimate goal of the program is to find housing for clients who are “literally homeless,” meaning that they might be living on the streets, under a bridge or in a tent. This is different from “chronically homeless,” meaning that the individual or family moves from house to house. The next step after finding stable and safe housing is to refer clients to the Job Placement Center to find employment. Rapid Rehousing can also assist with transportation expenses once a client finds stable employment. “We constantly meet with them to make sure they’re doing things to help them become sustainable,” says Rapid Rehousing Assistant Rich O’Donnell. But to attain housing, Rapid Rehousing needs a connection with landlords and property owners. Rapid Rehousing Assistant Tracy Jenkins noted that the open house was created to make a face-to-face connection with the landlords. She did just that as she greeted and introduced herself to attendees. Michael began the open house presentation by explaining the Ministry of Caring’s role in Wilmington and how Rapid Rehousing functions. He made a point to explain the reasons why a client may be homeless: they may be running away from abuse, their primary caretaker may have abandoned them or they could have lost their job. Michael also noted that the ministry is responsible for the rent payments to the landlords and property owners, so even through an eviction process, they are guarenteed rent. Tracy was hopeful about the outcome of the open house. According to Michael, even the small number of attendees can be a success if they receive properties from each of them and they spread the word about Rapid Rehousing. However, they will not be able to measure the success of the open house for several more months. It is Rapid Rehousing’s first step in the right direction as a team. Congratulations to the Rapid Rehousing team for collaborating on this event to assist our clients with the ultimate goal: gaining independence. 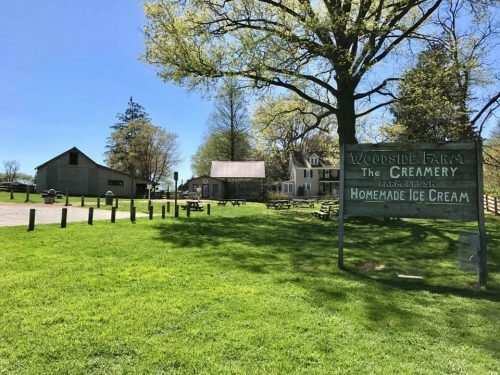 Woodside Farm Creamery co-owner Janet Mitchell says its Color for Caring benefit for the ministry has become an awareness campaign. The event can be especially educational for kids who may not realize that other families will not have Easter baskets or an Easter dinner. Office manager Mary Sepp said they enjoy reaching out and helping the Ministry of Caring and other nonprofits including the nearby volunteer fire company, Food Bank of Delaware, animal charities, Delaware Breast Cancer Coalition and American Lung Association. Beyond financial support, Woodside often donates ice cream and eggs, including hundreds of dozens to ministry feeding programs. The ministry’s high energy staff members and grateful attitude are what Mary and Janet love about this partnership. Make sure to color your picture and bring it to Woodside Creamery before Easter! 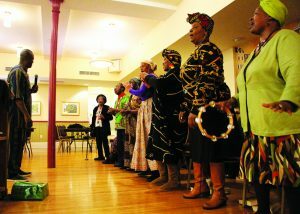 Residents of Sacred Heart Village I and II gathered in the Francis X. Norton Center for traditional African food, dress, and music. On February 15, Chaplain Corner Ministry lead residents in celebrating Black History Month. Chaplain Corner Ministry partners with the ministry with the goal of creating a choir. At this celebration, residents had the opportunity to learn through trivia questions about black history icons, the emancipation from slavery, and the Civil Rights movement. In addition, posters on the walls told of the accomplishments of black musicians, artists, athletes, scholars, leaders, and activists. Some of these included the greats such as Martin Luther King Jr., Rosa Parks and Jackie Robinson, as well as some “unknowns” such as Phillis Wheatley, W.E.B. Dubois and Althea Gibson. “Hold fast to dreams, for if dreams die life is a broken-winged bird that cannot fly,” Service Needs Coordinator Linda Richardson quoted Langston Hughes, who was named the black Poet Laureate by the NAACP in 1960. Linda says that her favorite part of the celebration was “ . . . seeing the smile on their faces. She began the annual black history month celebration about ten years ago because she wanted to ensure that the residents of Sacred Heart Village I and II continued black heritage. “[Hopes they take away]….a little more knowledge and little more something about black history they may not have known and found out,” says Linda. She recalls how one trivia question asked what product was the main force behind slavery in America. Though many thought the answer was cotton, the answer was tobacco. In addition to trivia questions, Chaplain Corner Ministries and a few Ministry of Caring employees led residents through traditional gospel song. Annetta Logan from Chaplain Corner Ministries played the piano with a bright smile. “There’s something about old gospel music that blesses my soul to see everyone enjoy,” says Annetta. Chaplain D’Rayfield Shipman, who founded Chaplain Corner Ministries, introduced every song and directed the choir. Like Linda, he hopes that the residents take home more knowledge and love for music. Check out our Instagram and Facebook page to learn more about black history icons this month! Read on to see the many ways you can fill a need at the ministry! French Toast Team Number Two serves Emmanuel Dining Room West every other Monday morning. Despite several inches of snow, Fred Krumm and Jenn Hrischuk served a warm breakfast while laughing and making conversation with guests. 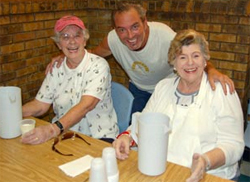 Fred began volunteering through Immaculate Heart of Mary and 20 years later now volunteers as an individual. Fred mentioned EDR to Jenn, who now volunteers with him. Fred says that he keeps coming back to EDR for two great reasons. After volunteering for two decades, Fred says he can see the positive impact EDR makes in Delaware. “When I look at the people who come in and how happy they are to have a hot meal, I know that makes a difference in their life,” says Fred. Jenn enjoys filling a need in the community. But not all volunteers at EDR serve food. Paul Sheers began volunteering at Emmanuel Dining Room West and South when Emmanuel Dining Room Program Director ReeNee LaFate asked if he could paint. He said he’d give it a try and has continued with painting and miscellaneous tasks the dining room needs to stay functional and maintain a welcoming appearance. Paul hopes to continue to make a contribution to EDR. Paul enjoys volunteering because he can give back his skills. A special tour recently gave ministry leaders a behind-the-scenes look at immense construction underway at the Village of St. John. “It’s magnificent,” says Brother Ronald, smiling as the tour wound through former offices and classrooms transforming into homes for low-income seniors. The project is creating 53 one- and two-bedroom apartments at the former Cathedral Church of St. John at Concord Avenue and North Market Street, thus saving the historic landmark neighbors once feared might be razed for retail development. The $22.5 million project, the largest in ministry history, is scheduled for completion in April. The Episcopal Diocese of Delaware listed the closed church for sale in 2012. 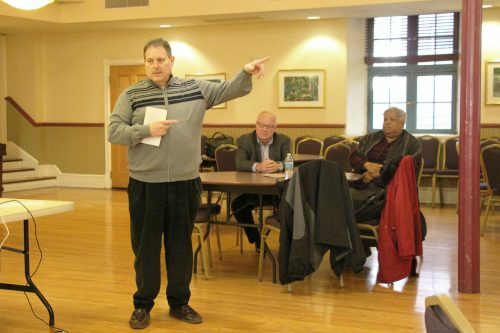 In 2015, the ministry and diocese announced the village plan and church trustees’ support by cutting the price nearly $1 million to about $650,000. After studies of need and possible funding, the ministry acquired the site July 26, 2017. The site, listed on the National Register of Historic Places, is being developed under the ministry-sponsored, separately incorporated Sacred Heart Housing Inc., with grants, sale of low-income housing tax credits, historic tax credit equity funds, and loans and allocations from the city, county and state governments. And those touring the bustling construction were equally happy. In room after room, hall after hall, they saw historic woodwork, windows and stonework being preserved as new walls, ductwork and doors shaped apartments. Many apartments will be in a new building, where the church once planned to add another of its own. Architect Kevin Wilson of Architectural Alliance designed the new structure to complement the mid-1800s’ church. Alexis I. du Pont led the construction of the original church – using local Brandywine granite called blue rock – but after his death from an 1857 explosion at his family’s powder mill, his widow, Joanna, spearheaded its completion the next year. Brother Ronald, who plans to honor both du Ponts at St. John Village, was awed by how closely the new building’s exterior stonework echoes the church’s appearance. As part of creating a true village at the site, he earmarked the church sanctuary as resident community space. As the tour progressed, the word “beautiful” was heard often. So were “amazing,” “incredible” and “wonderful.” And St. Mary’s Chapel, added off the sanctuary in 1919, will be kept as a haven where all may worship as they choose. Shanell from Jettset Mobile Studio drove her traveling salon van to Hope House III to give Christie and her two daughters, Christina and Carolyn, hair cuts worthy of any princess, queen or rock star. Shanell began her traveling salon to serve the tri-state area, particularly those who have mobility issues, time constraints or privacy concerns. Christie and her daughters originally met Shanell through the church they attend, Tree of Life Ministries. Shanell had contacted the ministry about providing salon services, and Program Manager at Hope House II & III Kim Boulden had the perfect family in mind. Shanell then asked if Christie and her daughters would like their hair done. Christie, who lives with her daughters in holistic housing, said she loved seeing her daughters get their hair done and that it helped her, too. “I’m grateful for the ministry and their help at the holidays,” says Christie. Although a hair cut may seem like an insignificant part of life, Kim found this to be important because many individuals experiencing homelessness have never had that experience. “They really don’t get the opportunity to do things that make them feel good about themselves because they are so focused on trying to survive,” says Kim. She added that an experience as simple as a hair cut can help clients in more ways than we might think. When the ladies stepped into Shanell’s van, they were instantly treated as celebrities receiving a luxurious hair wash and style. Kim’s favorite part was seeing the joy and gratefulness the family displayed — especially Carolyn, who was excited to look like JoJo Siwa, an American singer, dancer and actress. We are grateful for Shanell and the time she spent helping a family. 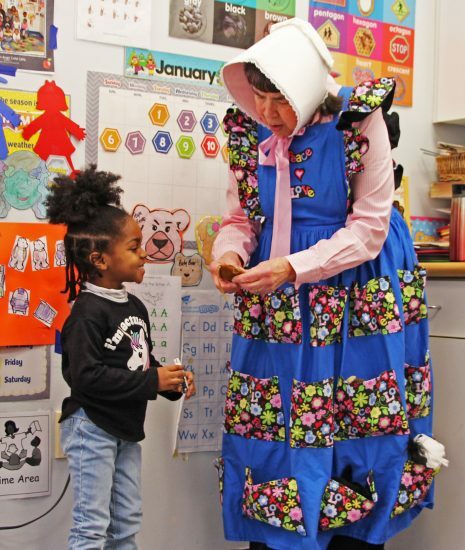 Mother Goose arrived at Guardian Angel Child Care with her pockets full of nursery rhymes. “I didn’t drive or take a bus here, I flew on the back of this goose!” says Mother Goose. She held up a soft toy goose to show the children. Mother Goose describes how windy the day was and that she and her goose friend need time to warm up inside. Each child aged 3 or 4 had the opportunity to reach into one of Mother Goose’s pockets for a mystery object. Each one related to a nursery rhyme: a mouse for “Hickory Dickory Dock,” a spider for “The Itsy Bitsy Spider,” and a monkey for “Five Little Monkeys Jumping on the Bed.” According to Early Childhood Administrator Janet Chandler, Guardian Angel Child Care has a partnership with Read Aloud Delaware in which volunteers come to read to the kids. Read Aloud Delaware is a nonprofit organization focused on early childhood literacy by reading aloud. According to their website, children that receive one-on-one reading with Read Aloud volunteers are more likely to be employed as adults, less likely to drop out of school and less likely to depend on public assistance. Read Aloud offers story time with Mother Goose once a year to GACC. This time is only offered to children aged 3 or 4 since they have longer attention spans than younger children. Mother Goose reads in January every year since nursery rhymes are the theme for that month. Janet says her favorite part of story time with Mother Goose is watching the kids pick a mystery object out of her pocket because they figure out what it is, show their friends and learn participation. She recalls how one child purposely dropped the Humpty Dumpty toy when they sang about his fall. 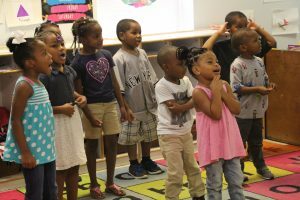 The nursery rhymes “require attention, audience participation — it’s sort of the whole idea of a presentation but within their classroom — taking turns, learning to watch each other,” says Janet. Janet adds that story time with Mother Goose helps establish language, reading and communication skills as the kids learn nursery rhymes throughout the month. She laughs as she recalls that her 10-year-old grandson still has his Mother Goose anthology and he now reads the nursery rhymes to her. January is a month full of singing and learning at GACC! A grant is helping the Ministry of Caring introduce its mission and work to potential new supporters. The grant funded an appeal letter that was sent out to those who are not currently ministry donors. “To have a grant for this is wonderful,” says Brother Ronald. He explained that the grant subsidized the mailing cost, but perhaps more important, it helped the ministry access the expertise of professional fundraisers who have designed many targeted appeals for nonprofit organizations. And, he said, this outreach helps raise awareness of the ministry’s work at a time when Delaware is one of only two states where federal officials found homelessness on the rise. Cindy Gamble, Planned Giving & Donor Base Manager, said she and other ministry staff were part of the collaboration. “We worked together on the campaign with Schultz & Williams of Philadelphia,” says Cindy. The appeal was sent in October to 35,000 potential donors. As hoped, some are responding by sending donations. But more important, Priscilla said, is the big-picture goal of building on the introduction provided by the direct-mail campaign so more and more people will know about the ministry’s work and become supporters – long term. The direct-mail campaign centers on a heartfelt letter from Brother about a woman he met when she was working at the Sacred Heart Village II security desk. 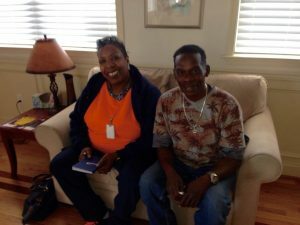 He quickly realized he had heard many seniors say things like “Jen can help you” and “If you need something, ask Jen.” Grateful to meet her and grateful for her helpfulness, Brother said he had no idea what he would learn next. Jen had been a client of the Ministry of Caring. After prescription pain pills became an addiction that cost her 15-year marriage and home, she wound up in jail after being arrested for driving while drug-impaired. She also had two children, was pregnant and knew she needed help. A friend told her to try the Ministry of Caring. Jen’s story is a moving one, of shelter at Mary Mother of Hope House I, hearty meals at Emmanuel Dining Room and daycare for her son, Justin, provided by the Ministry of Caring. Her story also is one of growing independence. In addition to the job at Sacred Heart Village II where she met brother, she has an apartment, a car and family. At this time we pause both to consider what we have done since the calendar last turned and look forward to what the new year will bring. As I reflect on 2018, I am humbled and overwhelmed with gratitude and appreciation. Your caring and dedication to helping the homeless and poor has made a difference in many lives. At the Emmanuel Dining Room each day, more than 150 men, women and children are served hearty meals in a welcoming and supportive setting. The three sites now have served more than 7 million meals. I am awestruck not only by that number but also the growing need in our community, where homeless – easing across the country – continues to rise in Delaware. Still, each of our programs and all of you who support them are helping the poor to improve their lives and live as independently as possible. Mary Mother of Hope House has served more than 7,000 women since its doors opened 41 years ago. Our emergency shelters, holistic housing and permanent residences this year provided thousands of nights of beds in dignified and uplifting homes for others whose circumstances – from addiction to disability to living with HIV/AIDS – have left them with nowhere else to go. 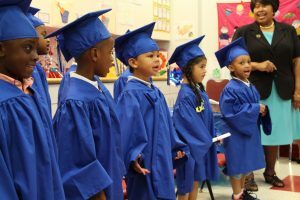 Our child care centers serve hundreds of children with five-star rated programs, letting many of their parents work, find jobs or continue their education. The Job Placement Center, helping unemployed people from the newly widowed to former inmates, succeeds in placing more than 50 percent of those who come through its doors, seeking the dignity of work. 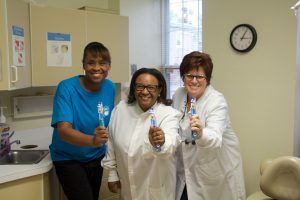 After a months-long hiatus, I am happy to say, the Pierre Toussaint Dental Center has a new dentist and is providing care for the uninsured, relieving their daily pain and making incredible improvements with needed dental work they may have lived with for years, simply because they are poor. Our Rapid Rehousing program has made outstanding strides this year, now placing more than 90 percent of referees applicants in homes of their own. This year, we also have continued to provide housing for hundreds of low-income seniors, mobile medical care, clothing, household goods for those moving to their own homes and services as simple as a hot shower for those who live on the streets. Your generosity at Thanksgiving and Christmas were especially remarkable, including many partnerships with community groups from New Castle County Emergency Technicians to the Port of Wilmington. With hard work, these projects provided more than 1,000 food boxes, and gave out winter clothing. The Adopt-A-Family program alone provided gifts to 936 children who otherwise might have had no presents to open on Christmas Day. Staff members also were very generous in following our tradition of bringing gifts for shelter residents and supplies to our annual staff breakfast. To say I am grateful is an understatement. I thank you for every individual employee’s effort, every supporter’s donation to the ministry, every kindness uplifts that uplifts the poor. And I look forward to 2019 as we continue to serve others – with open arms and hearts – throughout our programs, including the April completion of the Village of St. John. 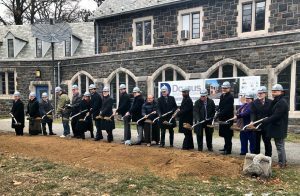 That is the biggest project in the ministry’s history and will provide 53 beautiful apartments for low-income seniors in the historic setting of the former Cathedral Church of St. John in Old Brandywine Village. Together in the New Year, all of us together will continue to help ensure that the poor are never treated poorly. May God continue to bless you all in 2019 for your generosity to the less fortunate. Jordan McCuthecon led her middle school in a sock donation drive. Jordan McCutcheon wanted to help those who don’thave much, so she donated over 2,500 pairs of socks to Mary Mother of Hope House I. After watching a video by Kid President on YouTube, Jordan decided to write to her principal at Alfred G. Waters Middle School to help her start a sock drive. Jordan was not deterred when she heard nothing in return. Instead, she approached the principal again, this time in person, who then connected her with the Student Leader Association. The students at AGW had pizza and donut parties for the sock drive and finally ended up with over 2,500 pairs of socks to donate. Program Director of Housing Annie Mountain could not contain her excitement as Jordan’s parents carried in bag after bag of socks for the residents. “We love to give them things because they feel like they’re worth it,” says Annie. Annie noted that the sock donations are especially important in the winter since most of the residents simply wear sandals in the summer. “We need young people to lead the charge,” says Annie about Jordan’s determination to help others. 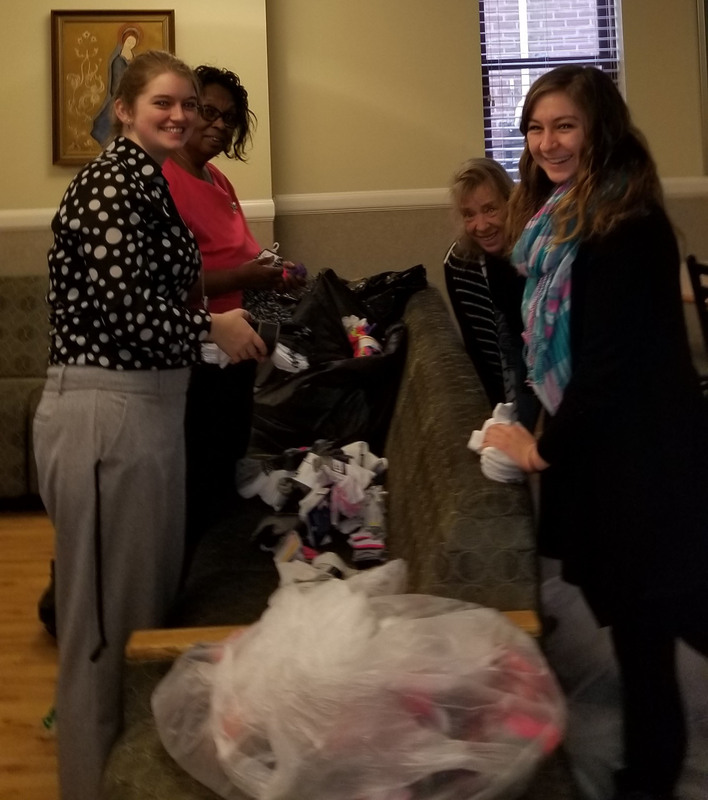 Program Manager Kim Boulden was excited that there were plenty of socks for all families – not just single women but men and children too. “There’s going to be a lot of warm feet,” says Kim. Thank you to Jordan and all her classmates at AGW Middle School for their hard work and generosity! Volunteers from many Wilmington companies, schools, and clubs donated their time and efforts to ensuring everyone had a Thanksgiving meal. St. Edmond’s Academy brought a busload of turkeys and all the fixings. Vicky and Jack Corrozi donated 30 complete dinners. Electricians’ Local 141 bought two carts full of turkeys. The first truck load of Thanksgiving goods was full by 9:30 am. 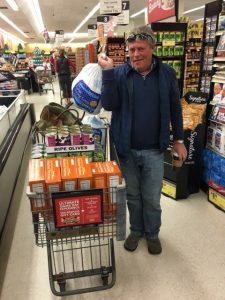 WJBR 99.5 partnered with the Ministry of Caring for the annual Turkey-Thon event held at the Acme in Hockessin on November 19. For 13 hours, WJBR employees and volunteers were on air to raise funds and donations. After the rush of donations, the New Castle County Emergency Medical Services Division gathered to organize the Thanksgiving baskets to give to Emmanuel Dining Room clients. The event created 680 dinners to feed over 3,000 people. WJBR General Manager AJ Lurie and Promotions and Events Director Chris Leonard say they are proud the radio station has partnered with the ministry for Turkey-Thon for 20 years. AJ and Chris say that since they are a community-based radio station, it’s important for them to take care of the community and do everything they can to help. They were grateful for the opportunity to meet a few EDR clients before the event. AJ and Chris say that they could tell the EDR clients were excited to receive the Thanksgiving baskets and were grateful for the support. Program Director at Emmanuel Dining Room West ReeNee LaFate says she was mesmerized and humbled by the turnout. She finds that Turkey-Thon helps the Ministry of Caring carry out the mission of treating everyone with dignity and respect. ReeNee’s favorite part of Turkey-Thon is seeing volunteers giving. ReeNee says that Turkey-Thon is a team effort that would not have been possible without everyone who volunteered. Residents of Sacred Heart Village had the opportunity to view The Merchant of Venice and participate in discussion. For just one night, residents of Sacred Heart Village I and community members visited 16th century Italy. 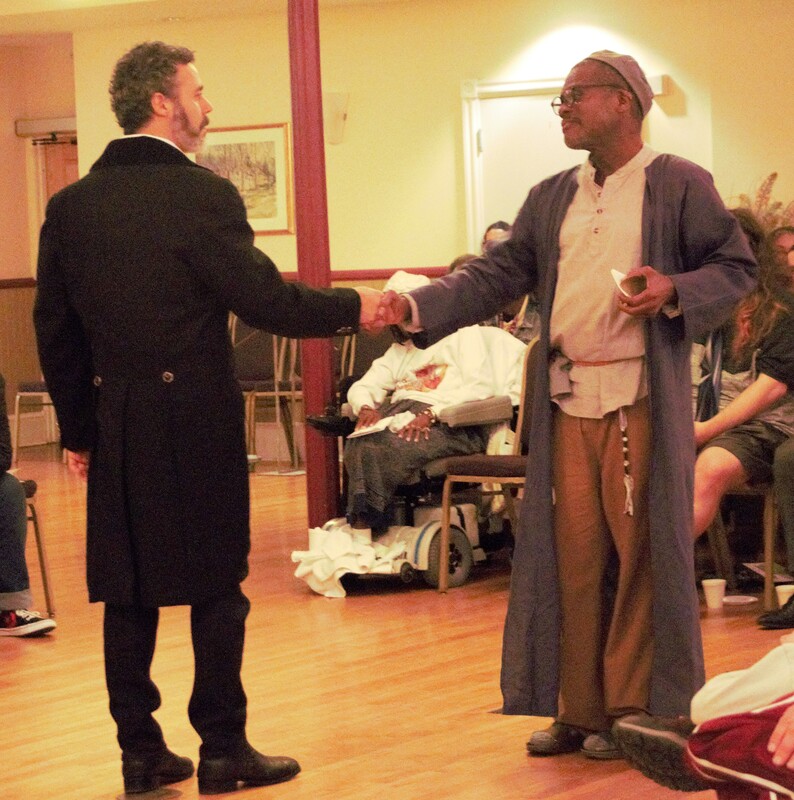 Delaware Shakespeare performed The Merchant of Venice on Oct. 16 at the Francis X. Norton Community Center as a part of their Community Tour. The plot follows Bassanio as he tries to win the hand of Portia and Antonio’s deal with Shylock, who is hated because he is Jewish. Shylock lends Bassanio money, but if Antonio fails to repay Shylock for Bassanio, then Shylock may take a pound of Antonio’s flesh. According to Producing Artistic Director David Stradley, the Ministry of Caring’s motto of “the poor should never be treated poorly” aligns with the mission of the community tour. “The purpose is to take high quality professional theater throughout the state — reaching the full spectrum of our community by going to non-traditional settings,” says David. 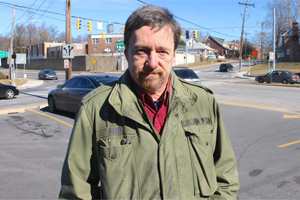 Some of these other settings include the Dover Public Library and the Delaware Center for Homeless Veterans. Service Needs Coordinator at Sacred Heart Village I Linda Richardson believes the play was more than just entertainment. David stated that The Merchant of Venice was specifically chosen to spark a conversation about the treatment of people who are perceived as different by the community. David’s favorite part of the performance was the discussion afterwards. At this time, the Ministry of Caring asks everyone to pray for those affected by the shooting at the Tree of Life Synagogue in Pittsburgh. We stand in solidarity with our Jewish friends. Twice a year, residents at Mary Mother of Hope House I get the opportunity to learn cooking skills at a workshop. “Why do we keep the peel on the apple? What does oatmeal give us? Which is bigger – a tablespoon or a teaspoon?” Kim Silva asks the women of Mary Mother of Hope House I. 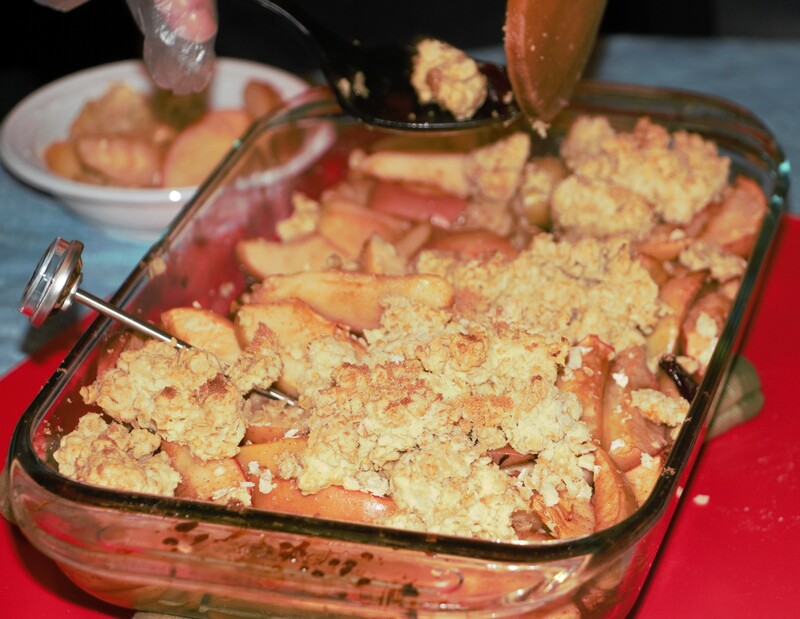 She asks for volunteers to help slice apples for this week’s recipe: apple crisp. 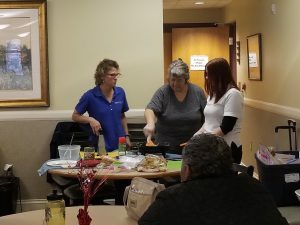 Twice a year, Kim leads a nutrition and cooking class at HHI through the University of Delaware and Supplemental Nutrition Assistance (SNAP) Program Education. Through a six-week workshop, Kim teaches the residents how to prepare a healthy meal. Participants receive a recipe and a cooking utensil, such as a meat thermometer. Program Director of Housing Annie Mountain finds the workshop invaluable to the women. One of the most rewarding results of the workshop for Annie is seeing community come together over food. HHI resident Marie DeFala particularly enjoyed the workshop because she previously attended a culinary arts school. “It’s learning and refreshing my memory,” says Marie. She noted that she learned more about washing produce and chicken products. Annie hopes that the women learn that they can make healthy choices in every aspect of their lives. “That can mean budgeting, it could mean moderation, it could mean new experiences – trying new things – and considering the possibilities of instilling an interest in learning more and pursuing a career in food services,” says Annie. Once the apple crisp is baked through, Marie and Kim dish a serving into bowls and offer the fall treat to the rest of the residents. The scent of fresh baked apples, cinnamon, and oats swirl through the air as the women enjoy each other’s company and ask Kim further questions on how to prepare healthy meals. Kim is available at ksilva@udel.edu or 831-2058 for those who would like further information about SNAP education. Staff members walked and raised money for House of Joseph II, our housing for men living with HIV/AIDS. AIDS Delaware and the Delaware HIV Consortium presented the annual AIDS Walk on September 22. Sr. Christa Rowe, OSC has participated in the AIDS Walk for the six years she has been Program Director at House of Joseph II, and more as a donor. She finds that the AIDS Walk is an opportunity to raise awareness and advocacy and to remember those who have died from AIDS. One of the people Sr. Christa walked for was Kiki, who was at HOJII last year and has since passed away from AIDS. Sr. Christa is grateful for others who walk for HOJII, such as CNA/DCP Annette Seeney-Hall. Annette walks to give back to the community she works with and so that people living with AIDS know about HOJII. She wants others who walk to realize that HIV/AIDS is nothing to be ashamed about. Annette also encourages people to break the stigma of AIDS by putting themselves in another person’s shoes. Sr. Christa also hopes that the stigma of AIDS will be overcome. She recalls how people will still bleach down areas where individuals living with HIV/AIDS have been even though the disease is not spread through skin-to-skin contact. Sr. Christa pointed to Jane Hatchadoorian as her mentor in the AIDS community. Jane walked every year for her son, who died from AIDS, until she passed away last year. Jane’s husband, Ed, walked this year in her memory. Sr. Christa is grateful for all who walked or donated this year. “By doing so [donating or participating], they’re showing the greatest, which is love,” says Sr. Christa. The Ministry of Caring Millenials hosted Crab Fest to fundraise money for the early learning and child care centers. 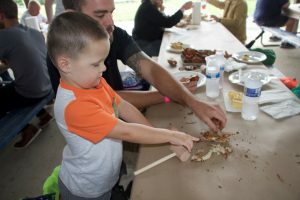 The rain and looming clouds couldn’t scare off a crowd ready for the Ministry of Caring’s third annual Crab Fest. Guests enjoyed crab imported from St. Michaels, Maryland and beer and beverages donated by NKS distributors. Blue Cat Blues Band and HaHa Charade provided upbeat covers and original music while guests hammered away to crack open the crabs. After emptying the crab shells, guests could play summer games, and partake in a live auction. Ministry of Caring Millenials guild member Kate Wright was pleasantly surprised with the record-breaking over 300 registrations. “We thought the turn out was fabulous especially with all the rain and the new location,” says Kate. Proceeds to the event go to the Ministry of Caring’s three child care centers. As the youngest guild group, the Millenials want to help the youngest in the Ministry’s services in turn. “We feel that it’s important to help the children of the poor so that hopefully we can help break the cycle and impact their lives in a positive way,” says Kate. Leading up to crab fest, the Millenials worked to fundraise the cost of the event. They raised awareness and sponsorships, while also working with local businesses for auction events. After months of hard work, Kate’s favorite part of the event is getting to interact with guests. Guild chairman Matt Bowe said there was an outpouring of hard work leading up to Crab Fest. “When you’re in the trenches in the team on the day of the event, it’s time to show the world what we created,” says Matt. Thank you to the Ministry of Caring Millenials for presenting another successful Crab Fest! Sister Carol Sukitz, a long-time member of the Ministry of Caring, passed away. We remember the legacy she gave. We honor the memory of Sr. Carol Sukitz, IHM (formerly Sister Marie Elizabeth). Born February 28, 1946 – Passed into Eternal Life July 4, 2018. Sr. Carol received a bachelor’s degree in mathematics and education and a master’s degree in social work from Marywood College. She received her doctorate in social work from the University of Pittsburgh. Before arriving at the Ministry of Caring, Sr. Carol worked as a teacher and social worker throughout Pittsburgh. Sr. Carol began her career at MOC in 1995 as the deputy director. She worked with different agencies and foundations to keep current programs together, advance those programs, and gain revenue for MOC. Louisa says that Sr. Carol was always looking for ways to grow and advance. A perfect example of Sr. Carol’s drive for growth is that she was responsible for getting digital into MOC’s administration and then throughout all the buildings. Louisa says that Sr. Carol had a personal effect on her work ethic. Senior Grant Writer Anthea Piscarik says that Sr. Carol brought MOC to a new level of funding. While working with Sr. Carol, Anthea says she strived to be as organized as she. Sr. Carol was in charge of both operating and the programs themselves. Anthea feels lucky to have seen a different side of Sr. Carol when she went to a conference with her in California. She enjoyed how Sr. Carol loved nature and saw everything with a child-like enthusiasm. After her time at MOC, Sr. Carol continued her career as a social worker in Pennsylvania. Anthea will remember how much Sr. Carol cared about the people MOC serves. We will always remember Sr. Carol and the mark she left on the Ministry of Caring. May she rest in peace. After temporarily closing, our Pierre Toussaint Dental Office for the uninsured has reopened and is welcoming patients with enthusiasm and quality care! Pierre Toussaint Dental Office has been serving uninsured patients since 1995. Throughout the years, we have seen dental staff come and go, and for a short time, the office had to close. Fortunately, on June 4, PTDO re-opened for patients with an almost entirely new staff! They have been busy over the past few weeks, and are excited to see patients. In the short amount of time they have worked together, they have already built a tangible camaraderie, and look forward to working together every day. 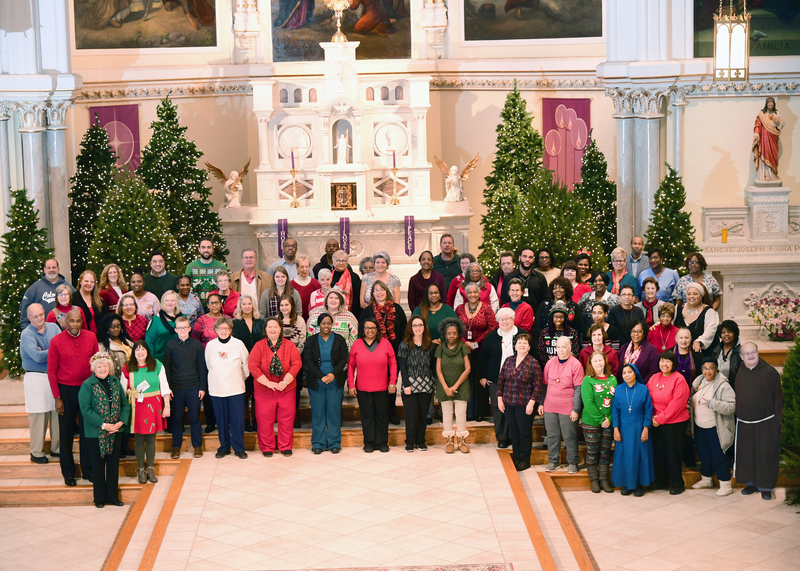 Every morning before opening their doors, the staff pray for the patients who will walk through the doors, for their own wisdom and sharpness of mind, and for the office, that it will be a program that blesses the community around them. Our new dentist, Dr. Tawana Medlin, is a Dover native and has been working in the dental field for almost twenty years. After receiving her bachelor’s in Biology from Delaware State University, she attended Howard University’s Dental School. According to her, her career really started in 2003 when she helped Delmarva Rural Ministries write a grant to start a dental program. That’s when Dr. Medlin discovered her passion. Although she has experience in both public health and private practice, Dr. Medlin’s passion is giving care to those who need it through community dentistry. “Working with underserved and underrepresented patients: that’s what I’m good at; that’s what I do,” she says. Dr. Medlin recognizes her blessings and considers it her life’s calling to use her education and resources in the community, helping people look good and feel their best. Now that she has joined the PTDO team, Dr. Medlin has a few ideas about ways to improve the practice. She envisions implementing a dental software system and digital x-rays, so that patients have access to the latest technology. She also wants to give patients an incentive to come to their appointments by encouraging them and getting the word out about PTDO’s services. Liz is passionate about educating her clients on overall health. They look at each patient holistically, even taking blood pressure checks for new clients so that they can be referred to other qualified healthcare providers if necessary. PTDO performs basic dentistry such as cleanings, exams, x-rays, and sealants. But if they can’t help a client with something, they always make sure to point the patient in the direction of the care they need, including other Ministry resources like clothing, food, and shelter. On Monday, May 14, the Child Care Center received a 5-star designation from the Delaware Department of Education’s Stars Program, in what is a huge accomplishment for our MOC child care centers! On Monday, May 14, the Child Care Center received a 5-star designation from the Delaware Department of Education’s Stars Program, in what is a huge accomplishment for our MOC child care centers! Il Bambino and Guardian Angel achieved five stars in 2017, making each of our three centers among the highest quality child care facilities in the state. Five stars means that all of our centers go above and beyond– the teachers and staff don’t just settle for what is required of them. It means everything is high quality. The materials are age-appropriate, the rooms are high quality, and the teachers are excellent. Certainly, the assessment process is an arduous one: Delaware Stars representatives show up at the center relatively unannounced, and select two classrooms to observe for a day. The assessors watch everything from how teachers speak to children, to how closely they follow the daily routine, to whether the toys and the facilities are in proper order. Paulette admits that being watched so closely can be very nerve-wracking for the teachers! After the observation is over, the teachers are interviewed. Questions can be about the materials they use, whether they follow the weather in their outside play time, and a number of other topics. The interview portion is intended to assess how well teachers know the policies, and whether those policies are being followed. Now that all three of our centers have reached five stars, Paulette’s hope is that we will be able to maintain this quality. For her, the key will be “keeping everything age-appropriate, building relationships with our families, and for our teachers to continue their education journeys… Teacher education is the key to keeping up with our ratings.” Congratulations to everyone at our child care centers who have worked so hard to make this possible! This Mother’s Day, donors wanted to make sure the women in our Hope Houses were not forgotten. This Mother’s Day, the women in our emergency shelters, transitional residences, and permanent supportive housing programs received wonderful gift bags donated from Great Dames and the parishioners of St. Mary of the Assumption. 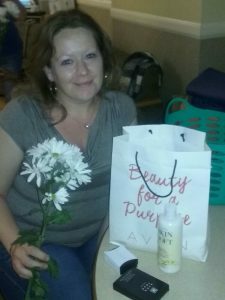 Each bag included lotion, body wash, perfume, makeup, and other fun items! In addition to the “spa kits,” donor Judy Settings gave money so that each woman could have Mother’s Day bouquets, completing the surprise. After all the care they give towards their children, these women deserve to pamper themselves, and this donation was a great way to remind them of that. “The mothers tend to be so focused on doing what is best for the children that they fail to think of themselves or engage in any self-care,” says Hope House II and III Program Director Kim Boulden. These gifts will allow the women to take time for themselves as well, which is especially important in the stressful life circumstances in which they find themselves. We thank everyone involved in treating our residents to such a wonderful surprise! 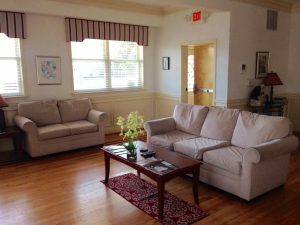 Settled right in Wilmington’s East Side, Mother Teresa House is an independent housing facility for people living with HIV/AIDS. 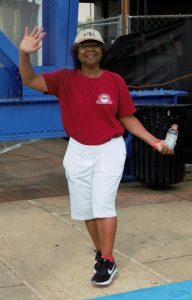 Renee Mosley has many roles at the Ministry of Caring. Part-time site manager at Emmanuel Dining Room West and the Job Placement Center, she is also site manager at Mother Teresa House. “More housing like this is needed,” Renee starts. “The reality is that people with HIV/AIDS live longer with modern technology and medicine. And these people want dignity.” According to Renee, Mother Teresa House offers exactly that. Residents have their own bedroom and bathroom, they cook their own food, and they’re given their own space to truly live independently. One resident, Anthony, who has lived at MTH for about a year and a half, has enjoyed his time there. “This place is good for what it does,” he reflects. “It’s good if you’re trying to save money. There’s privacy here. It’s safe.” Anthony enjoys the neighborhood as well. “I don’t worry about running into drugs or anything outside,” he says. Renee echoed Anthony’s sentiments about the neighborhood. According to her, this used to be a very economically depressed area, and now it’s being built up. Directly behind MTH, a row of townhouses is under construction. Community and volunteer groups can often be seen helping clean or beautify the area. Renee loves what she does at MTH. Although Renee’s time is split between three programs, she wants to be an active presence onsite whenever she can: “I build trust with the clients. I’m firm but fair… I represent the Ministry of Caring, so the poor should not be treated poorly.” Renee has many hats at MTH, as the Enforcer, Mother, even Cleaning Lady, and wants to show her residents that she respects them and cares about them. “I make the commitment to be invested,” she admits as the key to successfully building relationships. When asked what people should know about MTH, Renee responds: “When this program came along, it gave hope and provided housing that some people never thought they’d see, based on the conditions of how they were living before. This program is so needed, and more like this is needed.” We thank the staff at MTH for the work they do in the community and look forward to many more years of serving the Wilmington community! The DOL’s mobile outreach bus brings their services to the community. 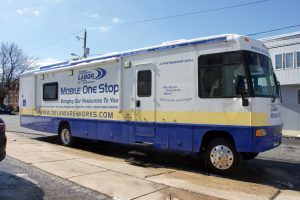 This mobile unit is a great resource for everyone in the community! Stay tuned for updates on when the bus will come to the Ministry next. In honor of AmeriCorps Week March 11-17, our AmeriCorps members supported Kuumba Academy’s “Girls on the Run” after school program. 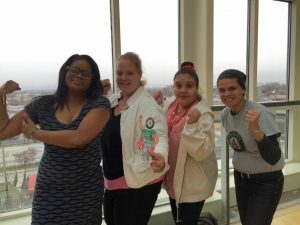 In honor of AmeriCorps Week March 11-17, our AmeriCorps members supported Kuumba Academy’s Girls on the Run after school program. Girls on the Run’s mission is to provide a fun body-positive environment for girls while promoting teamwork, confidence, and healthy behaviors. This was the first practice of the season for this team, and our members wanted to make sure the girls were excited to learn and participate. Members had a great time helping facilitate the event and weren’t afraid to get in some exercise right alongside the girls! Thank you to AmeriCorps for helping the event go so smoothly! The University of Delaware brings cooking and nutrition classes to our shelters and is changing the way our residents approach healthy eating. Many residents at our shelters have never been taught about the impact that food has on their bodies. Many have never had the financial freedom to make healthy food choices and instead must settle for whatever is available, affordable, or easy. Some have diet limitations due to health conditions or allergies, so choosing nutritious foods is vital in order for them to live a healthy lifestyle. The women at Hope House I are looking to change the cycle of unhealthy eating behaviors. Recently they wrapped up a six-week class on cooking and nutrition. The course, which happens twice a year, is facilitated by Kim Silva from the University of Delaware’s Expanded Food and Nutrition Education Program (EFNEP). Topics covered include nutrition, reading food labels, understanding the food pyramid, planning healthy meals, choosing fresh produce, and cutting back on toxic foods. “This is one of our most-loved workshops every year,” says Annie Mountain, Program Director of Hope House I. Participants watch a cooking demonstration and have a chance to make yummy treats like yogurt parfaits that they can enjoy at the end of each session. Annie has already noticed a difference in the way residents approach food: “I often hear the women chatting in the kitchen when they are doing meal prep about what is on a label or what would be a good side dish because they want a balanced meal.” The class is an exciting opportunity for the women in our shelters! It has been one year since our child care facilities adopted the Devereux Center’s Early Childhood Resiliency Project into their everyday curriculum. This year, parents and teachers have been implementing strategies to boost resiliency in children. There are three measurable factors that determine resiliency: attachment, initiative, and self-regulation. High levels of these three characteristics are essential in building a child’s ability to take on life’s challenges. Paulette Annane, Program Director of our three child care facilities, is hopeful about the progress that we have seen so far. “A lot of training has gone into this. The teachers had a two-day training and the administrators had even more. I got to go to Villanova for a ‘Flip It’ training about failings, limitations, challenging children, and strategies for those.” According to Paulette, there have been measurable improvements across the board in each of the three resiliency factors, and fewer observable negative behaviors. After years of homelessness, one EDR guest is gaining independence– and has this to say. Anthony Byrd (known just as “Byrd” to his friends) was fifty years old when he first moved to Wilmington. Diagnosed with bone cancer in 2015, Byrd faced financial challenges and other health issues, including a heart attack that same year. He lived in a private apartment but the cost of rent forced him to spend most of his income on housing; he was unable to pay his medical bills or buy groceries. 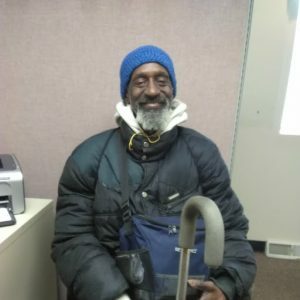 He walked two blocks every day for breakfast and lunch to EDR West where he greeted staff, volunteers, and guests with a smile and a kind word. “If all of you can come in daily to serve me, the least I can do is show my gratitude,” he can be heard saying. However, Byrd was still struggling to get by. Feeling desperate, he remembers telling God, “If you’ll get me health insurance and get me back on my feet, I’ll do the rest of the work. I’ll go to Emmanuel Dining Room every day. I’ll live for you.” And according to Byrd, that’s exactly what God did. MOC’s full-time AmeriCorps Volunteers spent a day dedicated to service in honor of Dr. Martin Luther King, Jr., along with thousands across the country. On January 15 and 16, the Ministry’s thirteen full-time AmeriCorps volunteers joined with thousands of others around the country to participate in a Martin Luther King Jr. Day of Service. MOC volunteers served at the Parkway Academy-North Community Clean-up, cleaning the streets of Wilmington in honor of Dr. King, and making our neighborhoods a more beautiful and safe place to live. The event finished at the Youth Empowerment Center with a parade and performances from local youth dance teams. MOC volunteers were joined by AmeriCorps groups from around Wilmington including those from Kuumba Academy and Great Oaks Charter School. 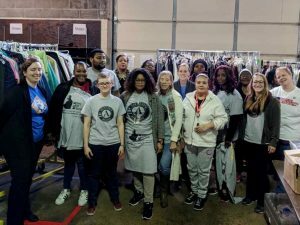 AmeriCorps volunteers also served at the Ministry’s Samaritan Outreach, helping pack hygiene kits and sort through donated clothing for distribution to those in need in our community. The new Village of St. John in Old Brandywine Village will offer affordable housing to low- and moderate-income seniors. Exactly 160 years ago, the Cathedral Church of St. John laid its foundation in the Old Brandywine Village neighborhood. After more than a century as a place of worship, the diocese was forced to vacate the church as attendance fell and the building could no longer be maintained. Finally, on December 15, 2017, the church started a new phase in life as low- and moderate-income senior housing. During the groundbreaking ceremony, MOC and VSJ Board member Mark Reardon offered this: “When God closes a door, he opens a window. That’s what is happening with this building.” St. John is returning to its roots. As a church, the building offered warmth and community to Old Brandywine Village; as the Village of St. John, it will offer comfort and hope. Brother Ronald first considered the building and began obtaining funding in 2012, calling it a “perfect place for housing.” And during the groundbreaking ceremony, Brother Ronald was described as the lightning bolt that ignites MOC’s fire: the fire that spurs the Ministry’s creativity, resourcefulness, persistence, and passion for serving the poor. As an MOC-sponsored program, the Village of St. John will continue to be a symbol of hope for Wilmington and will touch the lives of many to come. As construction begins, please pray that no obstacles stand in our way and that it will not be long before we stand at 2019 North Market Street at the opening ceremony of the Village of St. John. 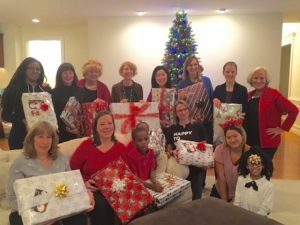 “I’ve never gotten a wrapped gift before,” said one Hope House resident as she was handed a present of robes, slippers, and toiletries this Christmas season. A group of volunteers gathered to wrap 47 of these presents in a lovely holiday tradition benefitting the women in MOC’s three Hope Houses. Rita Wilkins has organized this event, affectionately called the Robe Wrap, for the past seven years. The residents of Hope House I, II, and III often go without gifts for Christmas, so the kind gesture is very special to them. Making the event even more memorable, volunteers at the Robe Wrap had a chance to meet some of the residents and learn about the work that we do in our emergency shelters! Our Wilmington community came together this year to give back the the Ministry of Caring on Thanksgiving Day. 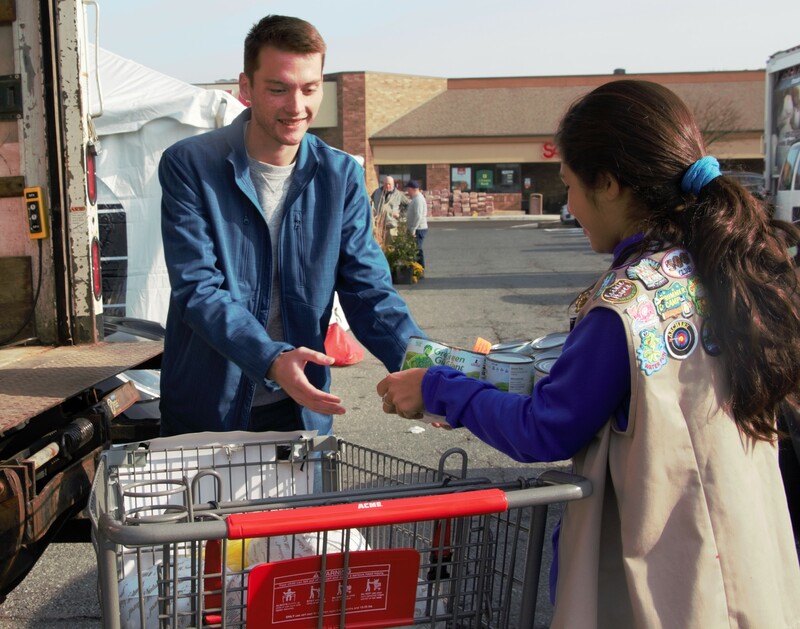 The Ministry partnered with 99.5 WJBR and the Hockessin ACME Markets to give hungry families a delicious Thanksgiving meal. MOC employees broadcast live all day while accepting donations of turkeys and non-perishable food items to give to the needy. We’re thankful for everyone who donated and everyone who helped put together this wonderful event! 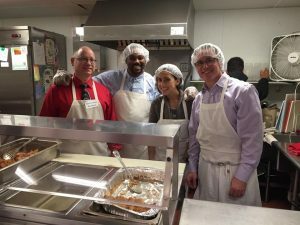 BlackRock employees served a meal at Emmanuel Dining Room South to spread holiday cheer to the hungry! The first year results are in: the children in our programs are improving their resiliency, thanks to Highmark Delaware and the Devereux Center for Resilient Children. This year, our three child care programs have been busy implementing the Devereux Center for Resilient Children’s Early Childhood Assessment Program. This program was generously funded by a grant from Highmark Delaware, and has resulted in significant resiliency improvements after the first year. Rachel Wagner, MSW, National Trainer and Early Childhood Mental Health Specialist provided training for our staff and had this to say about them: “The core leadership team amazed me with their insights and dedication. Paulette Annane, Program Manager, led the team to develop a comprehensive year-long implementation plan… [which] was thorough, thoughtful, and impressive. What impressed me further was their commitment to following the plan. In my regular check-ins over the course of the year, Paulette and the team stayed on track with their plan. And their commitment showed when the end of the year results came in.” She praised our staff as hardworking, dedicated, and enthusiastic, and it is clear that these qualities have had great returns for our children’s resiliency. We’re grateful to Highmark and the DCRC, proud of our staff, and looking forward to year two! 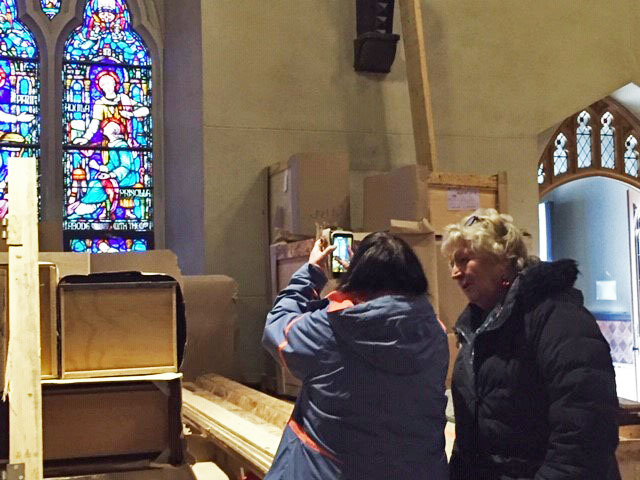 A precious historical artifact was recently stolen from the Cathedral Church of Saint John. The Ministry is offering a reward for its intact return. 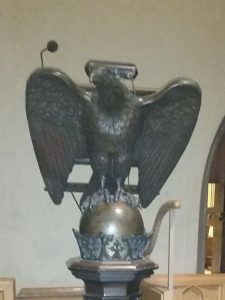 For nearly a century, a stunning bronze lectern has stood in the Cathedral Church of St. John in Wilmington. With four intricately-carved apostles at its base, lions on the main column, and an eagle and Holy Bible making the top, the lectern is certainly striking. It stands at almost seven feet tall and weighs hundreds of pounds, so stealing the piece of church history would not have been an easy feat. The Ministry of Caring is planning on turning the church into housing for low-income seniors. On a recent tour of the building, it was discovered that the lectern was missing. “Having stood safe here for so long, to have this disappear is heartbreaking,” says Priscilla Rakestraw, Development Director. The Ministry is offering $1,000 for information directly leading to its intact return. Police are investigating this theft, and anyone with information should call the main office at 302.652.5523. This year the Ministry has been implementing a new project to improve resiliency of children at three child care facilities with some exciting early results. 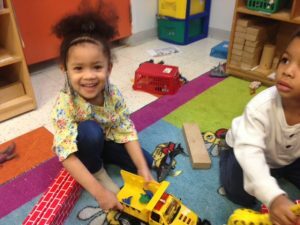 Last year, the Ministry’s three child care facilities received a $48,000 grant from Highmark Blue Cross Blue Shield Delaware to fund the Early Childhood Resiliency Project. The project is designed to tackle a major problem that children in low-income families often face: a lack of resiliency. This character trait sets children up for emotional and social success, but children growing up in low-income households are less likely to develop it. A lack of resiliency can have short and long-term consequences on children’s performance in school, behavior at home, and involvement in the community and the workplace. This is an issue that the Ministry’s child care staff are familiar with. Approximately 90% of children at MOC sites come from low-income families. In response, the Ministry received grant funding to implement the Resiliency Project, which would in part provide professional development to staff. Program directors and lead teachers received training on the skills necessary to support classroom teachers and assistants and develop the social and emotional health of children in their direct care. On Friday, August 18, Highmark CEO Tim Constantine and Community Relations Officer Matt Stehl visited the Child Care Center to assess the early results of the Resiliency Project. They made some exciting observations: 73.7% of children displayed a positive change in their resiliency levels throughout the 2016-2017 school year! At the beginning of this endeavor, only 15.8% of children had strong resiliency, but by the end of the year, that number increased to 40.8%. This is an exciting result for the Ministry’s child care centers. As a result of this project, the needy children who attend these programs have significant social and emotional growth. Many thanks again to Highmark Blue Cross Blue Shield for their collaboration in helping our children grow and succeed! Local farmer Stewart Ramsey dedicates an entire field of sweet corn to the Ministry of Caring’s Emmanuel Dining Room every harvest. Stewart is the fifth generation of Ramseys to run the farm, with his son Carl planning to take over one day. With changes to the competitive farming industry, Ramsey’s Farm has evolved from a predominantly crop-growing farm to what he calls an Entertainment Farm. They offer corn mazes, bonfires, a beautiful site for birthday parties, and more. Stewart prides himself on having relationships with his customers, and clearly loves being involved in the community. 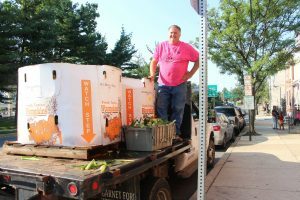 Many thanks to Farmer Ramsey for his generous contribution to the Wilmington community! 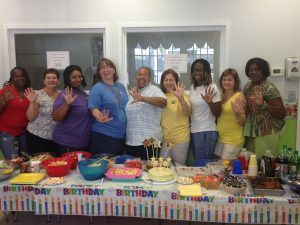 Guardian Angel Child Care has received a five-star rating through Delaware Stars for Early Success. This August, representatives from Delaware Stars for Early Success observed and assessed Guardian Angel Child Care and awarded the center five stars. Delaware Stars is a Quality Rating and Improvement System administered by the Delaware Department of Education, whose mission is to offer high-quality care for the children of low-income families. A prestigious fifth star is the highest rating a child care facility can earn. GACC follows on the heels of Il Bambino, which achieved the same exemplary rating a few months ago! Delaware Stars observed six of GACC’s teachers in action—more than fifteen hours of observation and interviews over the course of that week. Representatives inspected every classroom, every toy, making the rating a rigorous process. Throughout that week, GACC staff excelled. When ranked on a scale from one to seven, GACC teachers averaged 6.58—an almost perfect score! GACC earned some of the highest recorded scores of all time, and when you spend time with the teachers there, it’s clear the staff love what they do. 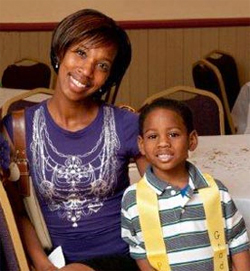 Tamia Patrick, with son Bryson Patrick, 5, is grateful for the small classes, safe environment and outstanding teachers at the Child Care Center. Ask five-year-old Bryson Patrick about the Child Care Center of the Ministry of Caring and he will delight you with everything you ever wanted to know about flowers, popular songs and his favorite subject of all, hermit crabs. Ask his mom Tamia Patrick and the topic shifts to small classes, a safe environment and outstanding teachers. But when you mention Bryson’s June 11, 2010, graduation day, mother and son speak with one voice. Departing from the only child care programs that Bryson knew—and came to love—was a bittersweet experience for both. Tamia, an administrative assistant, receptionist and file clerk in a Wilmington law firm, remarks that the Child Care Center and its affordable sliding-scale fees helped make it possible for her to work outside the home. “With Bryson in a safe place all day, I was free from worry about him,” notes Tamia. 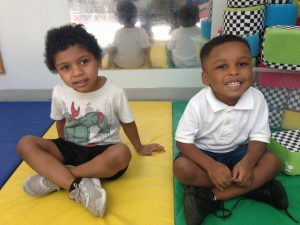 “And I always felt confident that his teachers would promptly address with me any concerns they had about Bryson.” She proudly adds that in September 2010, Bryson entered kindergarten at the Thomas Edison Charter School, where he has an older brother too. At peace that her sons are on the right educational track, Tamia has begun a new venture of her own. She is pursuing a certificate in art and design at night school while her mother cares for the boys. “I hope to work in an art museum someday and learn how to run it,” she says. Jamar Freeland, a formerly homeless man, now provides security for Sacred Heart Village through the House of Joseph Training Program. How would you describe the ideal caretaker? Maybe words like “dependable” and “trustworthy” come to mind. Sadly, incorrect assumptions and stereotyping prevent some people from ascribing these qualities to persons who experience homelessness. Thanks to an innovative Ministry of Caring program, however, many people are seeing another side of the homeless. And many homeless men in this program are receiving invaluable skills training as well as a newfound sense of purpose and mission. For over ten years, House of Joseph Transitional Residence has been assisting homeless men on the path to self-sufficiency. A unique feature of this facility is its job training program funded through the Supportive Housing Program of the U.S. Department of Housing and Urban Development. Residents engaged in the training program earn stipends and receive on-the-job training while working at Ministry sites. The training program filled a previously unforeseen need when the Ministry of Caring opened Sacred Heart Village in 2001. Now an entirely separate corporation, Sacred Heart Village was initially sponsored by the Ministry of Caring. A 77-unit housing complex serving low-income senior citizens, Sacred Heart Village has never been a typical apartment building. From its inception, the project has been envisioned as a community of neighbors who know and care about one another. An integral part of this vision is round-the-clock security provided by onsite “doormen.” Through outside-the-box thinking, it was decided to employ homeless men from the House of Joseph Training Program to provide security for the seniors living at Sacred Heart Village. From this unlikely idea was born an unbeatable match, a partnership that has succeeded beyond anyone’s expectations. Strong bonds have formed between the residents and their caring protectors. Perhaps each meets the other’s need for friendship or family. Residents often stop at the front desk to offer the doormen a home-cooked meal or some friendly advice gathered from years of experience. For their part, the doormen go beyond what would be expected of typical security guards. The gentlemen working at Sacred Heart Village have become surrogate family members, knowing when to make a joke and when to offer comfort. Following their experience at Sacred Heart Village, many have gone on to full-time careers in security. By adding an intensive work-readiness component to its transitional housing program, the Ministry of Caring helps prepare homeless men to become self-reliant members of the community. By providing security 24 hours a day, Sacred Heart Village raises the bar for quality in affordable senior housing. By uniting the two programs, the organizations leverage financial resources that improve services in two disparate programs. The true benefit—the value that goes beyond cost effectiveness or best practices—is the love, support and friendship that has transformed two sometimes-overlooked segments of the population. 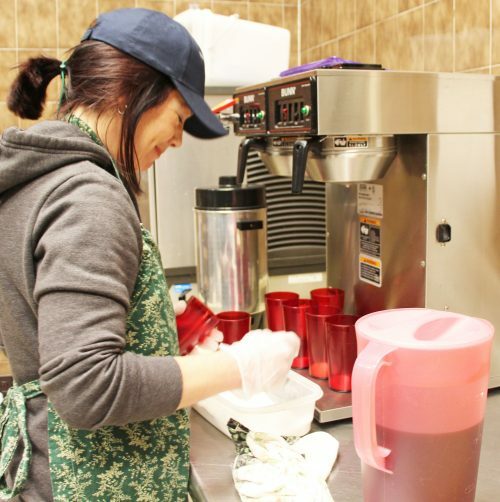 Smiling is contagious at Emmanuel Dining Room! Volunteers Mary McKernan and Barbara Kreuer and guest Gregory Lay prove it. The Ministry of Caring is a special place where many long-lasting friendships begin. Over 40 years ago, Mary and Barbara met through the Wilmington Newcomers Club. Even then, they shared a strong interest in community involvement and volunteerism. Years passed, both women raised families, and each pursued her own philanthropic interests. Around 2001, the women reconnected through a volunteer group at their parish, the Immaculate Heart of Mary in Wilmington. It was “God’s timing,” according to Barbara, that the two reconnected and began volunteering together at EDR. Their longtime friendship has been “built on the strength of common interests in the Ministry of Caring,” says Barbara. Barbara has over 20 years of volunteer and leadership experience with the Ministry of Caring. In 1990, she launched with Sr. Ann Marguerite Gildea, OSF, the Guild, the highly successful volunteer fundraising arm of the Ministry of Caring whose membership numbers 300 today. 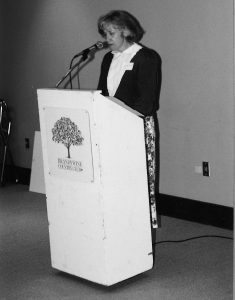 She was the Guild’s first president and planned the first Eleganza Fashion Show, a still-popular Guild event that raises funds for the Ministry. Moreover, Barbara has chaired the EDR Auction and was President of the Board of Directors of the Ministry of Caring for a term that ended November 2010. Mary began her volunteer work at EDR about 10 years ago with her late husband. She has also spent much time with the Ministry, attending EDR International Night dinners at Francis X. Norton Center. And she also has toured many other Ministry programs. Mary knits beautiful sweaters to be auctioned at the EDR spring auction each year. According to Sister Kathleen O’Donnell, OSF, EDR site manager, the two women are a “cheerful pair” who “have great chemistry.” Both women enjoy the “camaraderie of the people who work here, like Tony Attaway.” Tony, assistant site manager of EDR, keeps the dining room orderly while he mingles with the guests, volunteers, and employees, entertaining them with his stories and wit. A guest at EDR once told Barbara “When I came in, I was down. I feel so much better, just listening to your laughter.” Barbara exclaimed to the gentleman, “Now YOU have made MY day!” Barbara has observed that some people who have more worldly goods are less grateful for the gifts that life has given them. She is amazed, she says, by how most EDR guests respond positively when greeted, despite their circumstances. “Amen!” say Barbara and Mary in unison! A series about super special people in the Ministry of Caring community who do extraordinary things to help the poor. You can set your clock by his daily 8:00 AM appearances outside Emmanuel Dining Room, where he meets and greets his beloved clients lined up for their first meal of the day. You also might spot him walking miles around Wilmington neighborhoods in solidarity with the poor, who have no means of transportation but their feet. If you see him diverge occasionally from his “no automobile” lifestyle, it is only to accept food donations for the poor from local stores and businesses. “He” is Brother Rudolph Pieretti—Capuchin Franciscan friar, Delawarean since 1972, master mechanic and former Zambian missionary. He also is director of Emmanuel Dining Room, where the poor consume over 200,000 nutritious meals each year in comfort and dignity. Soon after graduating from Wilmington’s Salesianum High School, Brother Rudolph entered the Capuchin Order of Friars. 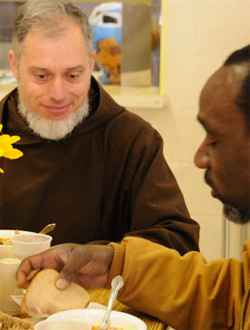 Like their founder St. Francis of Assisi, the friars have labored among the world’s poorest of the poor for over eight centuries. “Brothers work a lot with their hands and they spend much time in prayer” remarks Brother Rudolph. “I like to do both and found that this life suits me well.” Brother’s dexterity with his hands is evident in his talent for plumbing, building, carpentry and vehicle maintenance, skills that his father, Rudolph, a civil engineer, taught him as a boy. Mr. Pieretti and Brother Rudolph’s mother, Joan, still live in Wilmington, Delaware, where they raised a family of four sons and one daughter, among whom Rudolph is the oldest. In November 2009, Brother Rudolph arrived at the Ministry of Caring after 18 years of missionary work in Zambia, a landlocked country in Southern Africa formerly called Northern Rhodesia. Here, he worked among the local people caring for the sick in hospitals, visiting prisons, ministering to patients with AIDS and helping in any way that he could. He also repaired the mission vehicles and taught plumbing and carpentry to the native people. Brother describes Zambia as “a beautiful country with many natural resources—just as God created the earth.” The Zambians are noted for their peacefulness, hospitality, cheerfulness and kindness, he adds. The poor in America and in Zambia are “alike and different,” according to Brother Rudolph. “People are people. When we find ourselves in great difficulties, we all look for assistance wherever we hope to find it.” Poverty in America, Brother continues, is somewhat more complicated––layered with needs that often stem from drug abuse, alcoholism, the breakdown of society or family and other negative experiences. The people of Zambia, on the other hand, have much to offer in terms of how a person can be happy and content with the simpler things in life. Brother Rudolph departed from Zambia in 2009 only because “it was time to return” and to hand over the mission projects to the indigenous clergy. Rob Bair had passed out for the third time that day, when someone finally called an ambulance. He awoke in a hospital, with IV bags hooked up to both arms. Rob’s recovery from alcoholism ran through the Ministry of Caring. He went through House of Joseph I (HOJI), a Ministry shelter for men, before moving into a transitional residence and, finally, a shared home with other men in recovery. An Air Force veteran who worked full-time at a paint store and part-time at a liquor store, Rob’s life fell apart when his disease overtook him in 2011. He was fired from his job at the paint store, and then he lost his home when his income dried up. All of this caused him to drink even more. He was squatting in the home he’d been kicked out of and drinking heavily. He’d begun using drugs, too, when he finally hit bottom. That’s when he passed out, woke up in Wilmington Hospital, and decided to extend his sobriety indefinitely. on West Third Street was being renovated, so he stayed in the temporary shelter at Sacred Heart Residence. Now 54, Rob is employed and sober, with dreams of opening his own auto detailing business. He started a recovery support group, even though, early on, there were meetings where no one else came. He credits his sobriety to God, and thanks the Ministry of Caring for helping guide him back to the right path. He was joined at the table by state legislators and residents of Sacred Heart Village. Before signing the bill, Gov. Markell praised the Ministry’s efforts to help the people of Delaware. “The work you do in providing a sense of dignity for so many people in this state is extraordinary,” he said to Br. Ronald. Guild Founder Honored By City At the 12th annual Wilmington Awards ceremony held Oct. 1, longtime Ministry supporter and former board member and president Barbara Kreuer was honored for her faithful leadership in serving the homeless and poor in the greater Wilmington community over a span of more than 25 years. 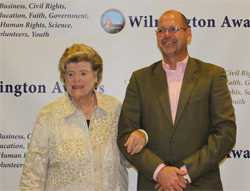 At the 12th annual Wilmington Awards ceremony held Oct. 1, longtime Ministry supporter and former board member and president Barbara Kreuer was honored for her faithful leadership in serving the homeless and poor in the greater Wilmington community over a span of more than 25 years. Starting out as a volunteer in 1989, Barbara soon founded the Ministry of Caring Guild, a volunteer group that remains vibrant to this day. Barbara’s steadfast commitment to serving the homeless is an inspiration, and we are thrilled to see her recognized for her selfless, tireless efforts. The annual Wilmington Awards ceremony honors community members of the greater Wilmington area who actively make a difference in the lives of their fellow Delawareans. Barbara received the award from the Honorable Dennis P. Williams, Mayor of Wilmington. Anne and Angela Grimes had more than their share of dental problems before they discovered Pierre Toussaint Dental Office (PTDO), a program of the Ministry of Caring. 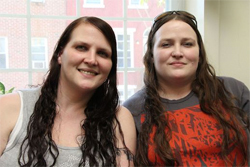 The twin sisters, 38, of Newark, say they’ve felt well cared for and respected since their first appointment in December of 2014. Anne had lost most of her teeth, and the six remaining teeth were rotting. Angela, having not been to a dentist in 10 years, had broken teeth and 10 cavities. They both had been living with missing teeth and severe tooth pain for a long time. The dental office provides free dental care to homeless men and women, and low-cost services to those with low income, like Anne and Angela. “I tell anybody that needs a dentist to come here,” Angela said.